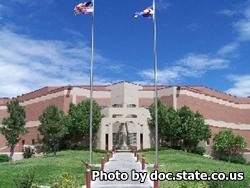 Colorado State Penitentiary is located in Canon City and is one of the facilities that makes up the East Canon Complex. This facility can house up to 750 offenders who are mostly closed custody inmates. This facility uses incentive programs to modify inmate behavior. This facility offers substance abuse treatment for offenders with drug and alcohol dependencies. Some of the educational opportunities offered by this facility include the ability to earn an adult basic education, and GED. This facility also encourages behavioral modification through a program called thinking for a change. In order to visit you must have first completed a visitors application and had it approved. You are required to schedule an appointment prior to visiting by calling (719)-269-5252. Appointments can only be made Monday through Wednesday 8:30am-3:30pm. The visiting hours are on Thursdays at the following times: 8:15am-9:45am, 10:30am-12pm, and 1pm-2:30pm. If the offender is in the management control unit, and has been incarcerated for over 30 days with no behavioral issues they may have two contact visits per month. Offenders who are in the Close Custody Transition Unit and have no behavioral issues may have up to four contact visits per month. All visits are up to 90 minutes in duration.